First of all I want to say that this is my personal experience and point of view. I will not accept that you hate on me if you have different experiences. I truly respect everyone that has a different opinion, but his is mine. Long story short, I had 5 240hz monitors in total. I still have an AlienWare AW2518HF and an Asus XG248Q. From all the 240hz monitors I tested, Asus XG248Q was by far the best. Not only the smaller screen size makes me play better, but also the input lag is the lowest I ever tried, 240hz wise. This monitor is also good to connect a console as the 60hz input lag is very good, but that´s not what matters here. After I used 240hz for almost 2 years now, I reached the conclusion that 240hz is not for me. 1- If I can´t sustain steady 220fps-240fps, the overdrive gets wonky, the ghosting is all over the place and the smoothness is gone. I am excluding GPU bottlenecks, as I play at low resolution scales to get the most FPS I can possible get. I can have steady 220-240 on Overwatch, Quake Live (20 years old engine) and CS:GO. And that´s it. So only in older engines or really light ones. As I mentioned on the first point, not being able to sustain high framerates on 240hz monitors is asking for problems. But will elaborate more. 3- The fact that I can´t sustain a steady framerate creates not only worse overdrive but the most important thing: It messes up my aim.. If you watch Battle(non)sense videos (and I´m quoting him because he is well known so is a good source) or if you talk with any great pro player; they all tell you that having a steady framerate is one of the most important things for aiming. Why? Because the mouse sensitivity is always different if the framerate is fluctuating, as frame times are different all the time, and it totally messes up your muscle memory. Having a steady tight frame time is crucial for a good aim. I can´t have this on a 240hz monitor because on most games framerates are all over the place. So I have a really low input lag but that doesn´t help me a single bit when my muscle memory has to adapt all the time. While if I cap a game to 120fps-141fps (depending on VRR etc) on a 144hz monitor, my aim is perfect, tight, consistent! Also as a plus, any modern CPU can do 120-141 fps easily! You don´t even need clocks higher than 3,7ghz/3.9ghz on Intel for that to happen, as long as you have enough threads. An i5 8400 for example is enough. The only game I couldn´t sustain steady 120-141fps was Pubg because is badly optimized. But I sill prefer 100-140 fluctuations to the 100-180 that I have with a 240hz screen. 4- Panel optimization. I don´t think 240hz panels are matured enough. I will explain why. 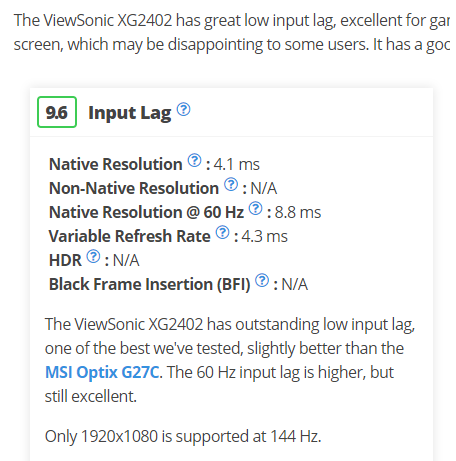 If you look at rtings review of my favourite 144hz monitor, the ViewSonic XG2402, or even the pcmonitors one, you will see that not only it has better pixel response time than any 240hz monitor tested, but the input lag is only 0,4ms slower than a 240hz monitor like the Benq XL2546. And this is 144hz vs 240hz!! Wich shows us that 240hz panels can go way lower input lag wise, but they are not simply matured enough. I have the ViewSonic XG2402 and I swear you will have a hard time noticing the input lag differences between its 144hz experience and a 240hz monitor. Trust me. You can slightly notice it but if you put them side by side you will keep switching between them to finally reach the conclusion that 240hz is faster. Is not easy to spot that. Also a good mature 144hz panel has great overdrive. Again, the XG2402 is a perfect example. It barely shows signs of overshoot at most presets, as PCmonitors also stated, and the response time is really fast, to the point that the motion clarity is very very good. And this is all while keeping an easy 120fps-141fps cap. So, in conclusion; to me 240hz is pointless. This took me almost 2 years and a lot of testing around many models, to find out. I aim worse; my CPU is "crying" with usage; fps spikes occur; overdrive is wonky as soon as you drop from the really high framerate values; the input lag advantage is not enough for me to play better. Now, at 144hz my average score after 50 rounds was 41350. At 240hz my average score after 50 rounds was 39950. Really close results. We can consider that I aimed as good with 144hz as I do with 240hz. The thing is that this engine is light, so I could use a steady 239fps cap without any fluctuation at 240hz. Same thing with the 143fps cap I used at 144hz. But in a game where my fps are all over the place, I end up aiming worse. My LG accuracy on Quake is higher with 144hz aswell. I can track enemies perfectly without any frame fluctuation. I can´t be as good at 240hz with fluctuations. I reached 58% LG at 144hz several times. I never did with 240hz. Keep in mind 58% LG is extremely hard to do, even against bots that barely move. LG is my strongest weapon and I practiced a lot of it. Once again, 144hz makes take the best out of it. And that´s basically it. Sorry for the long text. This isn´t by any means an universal truth. This is my opinion, point of view and personal experience. This thread is only telling you that to me 240hz weren´t worth it. I´m about to sell all my 240hz models now and will stick to my ViewSonic XG2402. Maybe in few years new models come out and new CPUs with crazy good IPC and clock speeds can sustain 220fps-240fps easily on any engine. That´s why tech is always evolving. For now I will stick to the refresh rate that offers me enough smoothness and makes me, at least, as good as if I was using 240hz. Last edited by Notty_PT on 24 Jan 2019, 00:10, edited 2 times in total. Re: Why I´m done with 240hz! I'll watch my fps but I don't have a problem with my set up to maintain 240+ on overwatch. I agree that keeping the fps optimal is hard for the cpus. The gpu utilization is under 80 percent so I know it's not a gpu bottleneck while cpu always is 80+. As I mentioned, Overwatch, CS:GO and Quake Live are the only 3 games where I could sustain steady high framerates without any problem! But I play a lot more games. Re: Why I'm done with 240hz! Notty_PT wrote: Why? Because the mouse sensitivity is always different if the framerate is fluctuating, as frame times are different all the time, and it totally messes up your muscle memory. Having a steady tight frame time is crucial for a good aim. I can´t have this on a 240hz monitor because on most games framerates are all over the place. You bring up many good points about fluctuating latency issues during fluctuating framerate situations. This was earlier explained in the Lag Training Effect in my other "milliseconds matter" post. 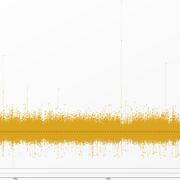 The dynamic input latency caused by varying frametimes throws off aiming. Chief Blur Buster wrote: The Lag-Training Effect. You're often pretrained for a specific lag. Basically aiming at a moving target. Say, archery shoot at a 1000 pixels/second moving target. Or FPS turning 1000 pixels/second shooting without stopping turn. Expert players who has the uncanny capability of shooting without pausing your turn (ala shooting while continuously turning). A 5ms lag increase/decrease means an overshoot/undershoot of your aim by 5 pixels. Now if target was moving 5000 pixels/second, you now have an average 25 pixel overshoot/undershoot of your aim. This persists until you retrain towards the new lag. You don't have to feel the millisecond to notice your aiming feels wrong or statistically off from the sudden change in lag. Notty_PT wrote: And that´s basically it. Sorry for the long text. This isn´t by any means an universal truth. This is my opinion, point of view and personal experience. This thread is only telling you that to me 240hz weren´t worth it. A fair statement. What may be worth it to one person might not be worth it to another. It's not worthless to everybody. As you've said, you see advantages. It's the games that is a big problem in holding back the Refresh Rate Race in many ways. The new game programming techniques needed to milk the high-Hz (And possible future frame rate amplification technologies, e.g. similiar to Oculus Asynchronous Timewarp that converts 45fps to 90fps) may be required for the Refresh Rate Race. Also, in the future -- instead of trying fps_max 240, you may prefer fps_max 120 and use Frame Rate Amplification Technology (FRAT) (new Blur Busters term for framerate-multiplying tricks like lagless interpolation/reprojection/timewarp/whatever technologies) to convert 120fps->480fps with ultraperfect frametimes. This is key for future 480Hz and 1000Hz monitors with consistency latencies. And 100fps caps (or 125 or 200 or whatever) may be all we need for future 1000Hz monitors with tomorrow's improved descendants of the Oculus 45fps->90fps conversion. It's sort of realtime lagless non-blackbox interpolation that uses the 1000Hz controller input autofeeding into the reprojection to shift everything around smoothly and quickly. Old-fashioned interpolations have to do guesswork/latency but automatically feeding supplemental data (e.g. Z-buffers, high-Hz controller data, etc) now makes it possible to create lagless/artifactless algorithms to amplify framerates with only a little extra silicon. This will need to be applied to 3D models, not just background scenery, and that is another technology challenge that is undergoing research by many companies. We may not see the fruits of this stuff for another few years but this may help the trend towards future Retina Refresh Rates. New techniques to help keep aiming latency consistent during fluctuating framerate situations may be needed. For example, and intentional dynamic latency added to the mouse to keep it at ~144Hz latency during 144fps-240fps framerate fluctuation. 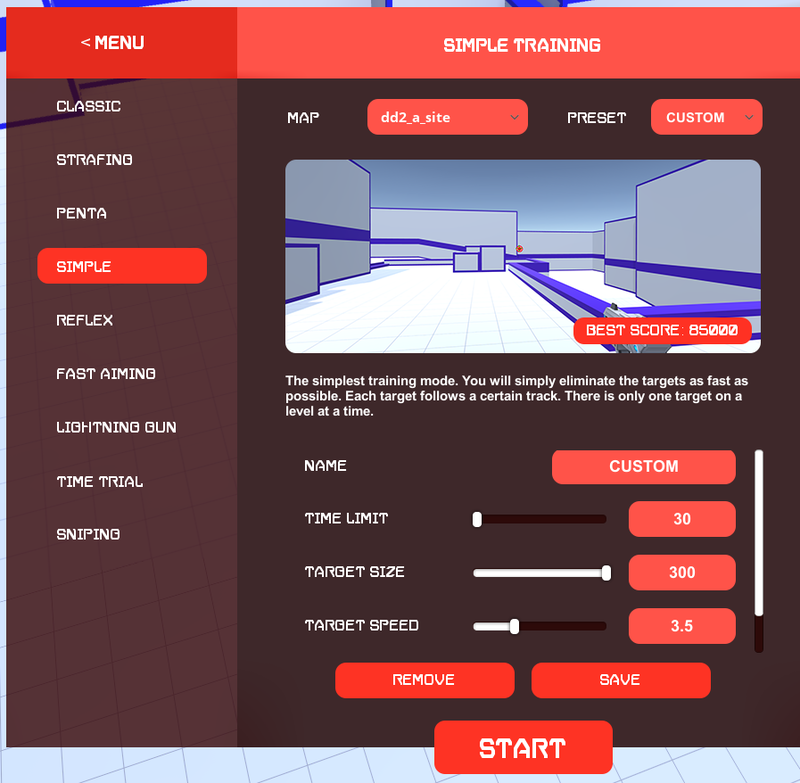 If more games utilized virtual-reality-style programming techniques to interrupt rendering (e.g. dynamic detail lowering in realtime) to guarantee a frametime, that would be a huge help. Forza Horizon 4 new "Dynamic Optimization" feature has an option to realtime adjust graphics (detail, view distance, etc) to ensure framerates automatically stay high and consistent. Although I have not yet tested at 240Hz, BattleAxeVR has confirmed it helps the game stay consistently locked at high framerates. Such dynamic optimization techniques could be useful for FPS in the future. I own an Oculus Rift VR headset too. It has a "90fps or die" feature because some people get headaches if the framerate drops a bit. Framerates need to be absolutely perfect (peeerfect) in virtual reality to successfully give you the Holodeck immersion effect. A single stutter can break the immersion effect. (It doesn't always for everyone, but it can for many people). That's what makes Oculus Rift 100x better than Google Cardboard. It has boldly stepped into the the art of framepacing perfection in ways that no recent FPS has gone. It set the gold benchmark in modern VR, with others (Vive, etc) copying the Oculus ultrasmooth low perfect stutter free low-persistence feature. Frame pacing par excellencé, bar none. Magnifique! So game developers have to up their dynamic optimization skillz (found in few non-VR games other than Forza 4) and I'm impressed at how much better framepacing technology is in some of the VR games compared to the non-VR games. Sure, some of the cheaper VR games are crappy framepaced, but the better ones are so impeccable with extremely good dynamic detail level increase/decrease to keep frametimes permanently perfect. So, why don't we have game developers import this knowledge of these framepacing innovations into traditional games to achieve perma-240fps? (or even 120fps-reprojected-to-240fps/480fps -- through future frame rate amplification tech (FRAT). We know that frametime precision needs to improve in the Refresh Rate Race. If Blur Busters grows big enough in a few years -- if we can eventually afford it -- indeed, we'll look into incentivizing (Bounty prizes? Blur Busters Seal Of Approval? Awards? Etc.) for game developers who succeed in ultrasmall 0.1% frametimes or other framerate-consistency benchmarks. Frame rate amplification technologies. Latency-consistency technologies. Who knows? The Refresh Rate Race shall march on... FTW! phatty wrote: I'll watch my fps but I don't have a problem with my set up to maintain 240+ on overwatch. Even if someone is seriously playing MANY aim-dependant multiplayer games, dont 240hz monitors have abilities to work at 144hz, 120hz etc? They do and I decreased the refresh rate in games like Battlefield, for example, but then the overdrive is really bad on all the panels I tested and thats a big problem! They are not optmized for it. Asus XG248q could have low input lag even at 144hz but with bad pixel beahviour. The other first gen 240hz panels are very slow at 144hz 165hz etc. With what you'll save during 2019, you'll be the first to get an OLED. MatrixQW wrote: With what you'll save during 2019, you'll be the first to get an OLED. But I will defo making a bit of money now selling my 240hz models! But hey, that´s usual business amongst enthusiasts ahah. Some buy a new phone model all the time and sell the older ones, others buy CPUs or GPUs. I buy monitors. But my infinite search for the "perfect one" is over. And the winner is easy to pick: ViewSonic XG2402 Now bring that Oled! Are you using GSYNC? I think GSYNC is supposed to dynamically control the overdrive so you don't get that effect. I'm happy with mine XL2540. I've owned and used dozens of monitors before that 240Hz one. I just play only one game: Quake Champions and Quake Live before it. I don't use any x-sync or motion blur reduction techs. Because the mouse sensitivity is always different if the framerate is fluctuating, as frame times are different all the time, and it totally messes up your muscle memory. I don't get that because Quake Champions polls input 1000hz. Use simple test: set 60fps in Quake Live and try to play and set same 60fps in Quake Champions and you will feel difference.